Made in October 1980. NOS, though the sleeve is pretty rough. 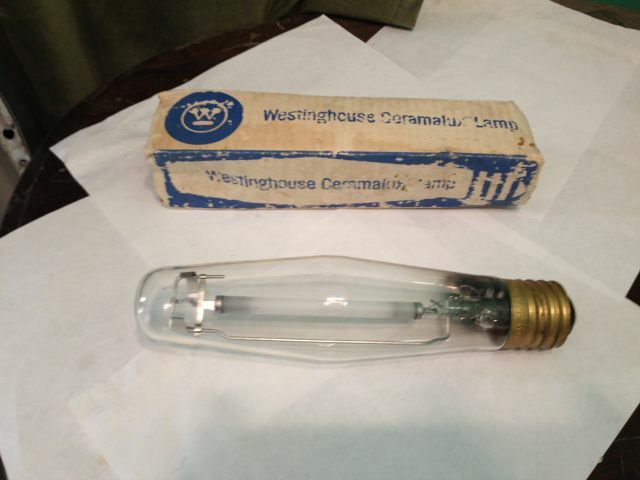 The arc tube looks more milky white than the arc tubes of todays HPS lamps, although Westinghouse made the sapphire ones just a couple of years earlier. Look Westy eh? Now got long gone with LED greenstar in it place . I remember the same, enjoying that blue light for just a few minutes before the awful color lol. Interesting that is has what looks to be a GE Lucalox style amalgam reservoir at one end of the lamp. Nice catch Dave, I also have one from August 1977. I believe that these were the last sodium lamps made by Westinghouse featuring the niobium cup seals before the company switched to the elusive wire/clamp seal design in the early 1980s (which went on to be replaced by Philips' own tubular compressive seal construction in '84-'85).